gives a list of eigenvector centralities for the vertices in the graph g.
gives a list of in-centralities for a directed graph g.
gives a list of out-centralities for a directed graph g.
EigenvectorCentrality will give high centralities to vertices that are connected to many other well-connected vertices. EigenvectorCentrality gives a list of centralities that can be expressed as a weighted sum of centralities of its neighbors. For a directed graph g, EigenvectorCentrality[g] is equivalent to EigenvectorCentrality[g,"In"]. The option WorkingPrecision->p can be used to control precision used in internal computations. EigenvectorCentrality works with undirected graphs, directed graphs, multigraphs, and mixed graphs. EigenvectorCentrality returns a list of non-negative numbers ("eigenvector centralities", also known as Gould indices) that are particular centrality measures of the vertices of a graph. The returned centralities are always normalized so that they sum to 1. Eigenvector centrality is a measure of the centrality of a node in a network, based on the weighted sum of centralities of its neighbors. It therefore identifies nodes in the network that are connected to many other well-connected nodes. This measure has found applications in social networks, transportation, biology, and social sciences. For a connected undirected graph, the vector of eigenvector centralities satisfies the eigenvector equation , where is the largest eigenvalue of the graph's adjacency matrix . In other words, for a connected undirected graph, the vector of eigenvector centralities is given by the (suitably normalized) eigenvector of corresponding to its largest eigenvalue. For a disconnected undirected graph, the vector of eigenvector centralities is given by a (suitably normalized) weighted sum of connected component eigenvector centralities. For a connected directed graph, the in-centrality vector satisfies the equation and the out-centrality satisfies . 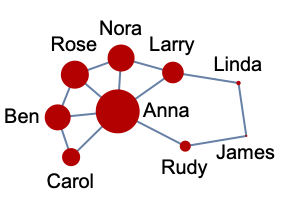 An additional "In" or "Out" argument may be specified to obtain a list of in-centralities or out-centralities, respectively, for a directed graph. EigenvectorCentrality returns machine numbers by default but supports a WorkingPrecision argument to allow high-precision or exact (by specifying Infinity as the precision) values to be computed. EigenvectorCentrality is a normalized special case of KatzCentrality with and . A related centrality is PageRankCentrality. Eigenvectors, Eigenvalues, and Eigensystem can be used to compute eigenproperties of a given square matrix, and AdjacencyMatrix to obtain the adjacency matrix of a given graph.